On Tuesday, redshirt freshman nose tackle Damion Daniels spoke to the media for the first time. Flanking him were the Davis twins and sophomore Deontre Thomas, with fifth-year senior Freedom Akinmoladun off to the side overseeing the whole group before he got pulled aside to do his own interview. What’s the reason for the group interview? Thomas said that defensive line group does everything together, so why shouldn’t that include interviews? The players’ mindset fits perfectly with that of their position coach, Mike Dawson, who has done his best to avoid singling out any individual in all of his interviews with the media this spring. When asked about the progress of the young players in his room, Dawson spoke to the defensive line group as a whole. While the players have developed an intense bond, that hasn’t deterred them from getting after it and competing in practice. “I think the whole group has come along together pretty well,” Dawson said. “There’ve been some guys that have taken bigger steps, some guys a little smaller steps, but as a whole the group has improved and kind of pulled each other along. The good thing is there’s a lot of competition in that room right now. 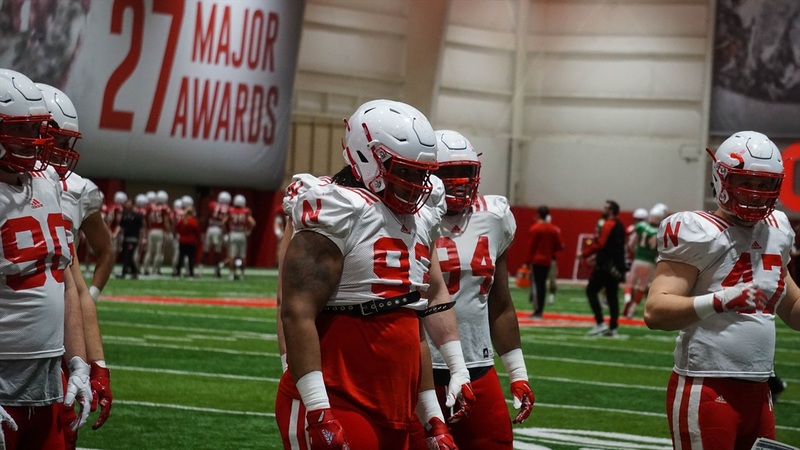 As for Daniels, he said he spent his redshirt year reshaping his body and has continued that under the watchful eye of strength and conditioning coach Zach Duval. Daniels said he has cut 10 pounds of fat and added nine pounds of muscle. He described himself as 6-foot-3 and 325 pounds. Daniels said he is moving a lot better than he was a year ago and is ready to make an impact. Going off of the roster without updated measurements, Daniels would be the heaviest player on the roster. However, he doesn’t want to be limited to just run-stuffing duty. “Instead of being a first- and second-down dude, I want to be able to go first, second, third and probably on fourth too,” Daniels said. Daniels said the pace of practice as dictated by the speed of the offense has helped the defense as well and should continue to do so throughout the fall. Speed is something Dawson wants to see out of his linemen as well, especially in Saturday’s spring game. With senior defensive tackle Mick Stoltenberg on the shelf for the spring game, Daniels should have plenty of opportunity at nose tackle on Saturday to introduce himself to a packed Memorial Stadium and show the fans — and his coach — what he can do.